Sweet and rich, soft and chewy with a crunchy pine nut crust, these cookies are super easy to make, naturally gluten-free, and really delicious. 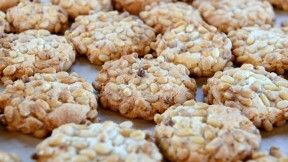 Pine Nut Cookies (Amaretti con Pignoli) are featured in the Homegrown Heroes and A Heartland Holiday Feast episodes of Lidia Celebrates America. Arrange one rack in the upper third of the oven and the other in the lower third. Crumble the almond paste into a mixing bowl. Beat with a handheld electric mixer till finely crumbled. Sprinkle the sugar over the almond paste and continue to beat until the sugar is incorporated. Beat in the egg whites, one at a time and continue beating until the batter is smooth. If using the pine nuts, spread them out on a plate. Pinch off a tablespoon-size piece of dough and roll between your palms to form a ball. Roll ball in pine nuts or just place it on the baking sheet if you want plain cookies. Repeat with the remaining dough. Bake the cookies until lightly browned and soft and springy, about 20 minutes. Remove and cool completely on wire racks before serving. The cookies can be stored at room temperature for up to a week. The plain cookies can be dusted with confectioners’ sugar before serving.